For Firmware Upgrade: BASrouter  Version 3.0.6, please contact technical support. The BASrouter firmware version 3.0.6 offers the latest BACnet protocol revision, BTL listings for both B-RTR and B-BBMD device profiles, and enhanced diagnostic features for BACnet internetwork analysis and troubleshooting. 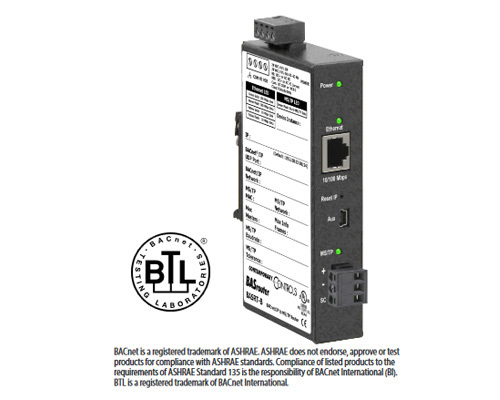 The BASrouter is a BTL Listed compact BACnet multi-network router which provides versatile stand-alone routing between BACnet/IP, BACnet Ethernet (ISO 8802-3), and BACnet MS/TP networks. The BACnet router is web page configurable and it is powered by 24 VAC/VDC. The BASrouter has a number of troubleshooting/diagnostic capabilities. The BACnet MS/TP "Status" webpage contains a graphical table of all of the MS/TP devices on the network and their status. Also provided are network statistics, in addition to a BACnet/IP "Routing" webpage with a discoverable routing table which is useful when setting up or troubleshooting a BACnet network. The BAS Router is housed in a metal case that mounts on 35-mm DIN-rail and is powered from a 24 VAC/VDC (± 10%) source. There is one MS/TP port and one 10/100 Mbps Ethernet port. The MS/TP port offers an optically-isolated transceiver. It has a removable 3-pin terminal block for the EIA-485 connection. The Ethernet port offers a shielded RJ-45 connector. Auto-negotiation and Auto-MDIX allow this port to automatically match connections to the attached equipment. Therefore, either straight-through or crossover CAT5/6 cable can be used for hook-up. A resident web server allows for commissioning, and troubleshooting using a standard web browser. A reset switch is provided on the router to return the unit to the factory default IP address of 192.168.92.68 (/24). Three LEDs are provided: The power LED glows green when proper power is provided. A bicolour Ethernet LED glows green for 100 Mbps, and yellow for 10 Mbps, and indicates activity by flashing. MS/TP LED flashes green when valid MS/TP traffic is received. When flashing continuously and without long interruptions, the MS/TP receive LED is a good indicator that the MS/TP network is operational. Internal MS/TP bias and termination jumpers allow flexible bias and termination options. They can be removed for mid-span installations. Interested in a portable version that takes USB power?